FAIRFIELD, Pa. (CNS) — The grinding sounds of an excavation and construction site yielded to the intonation of a solemn pontifical Mass and prayers for the future on a vista in Fairfield July 25, where construction is underway for a second monastery for the Discalced Carmelite nuns in the Harrisburg Diocese. While the building materials for the cloistered monastery are still being prepared for construction — namely, the excavation of stone from the land on which it will stand — the early development of its farmstead can already be seen. True to Carmelite tradition and architecture in the footsteps of their foundress, St. Teresa of Avila, the nuns are creating a type of settlement that will include a chapel, a novitiate, a building for the professed, an infirmary, a guest cottage chaplain’s quarters, walkways, gardens and a small farm. 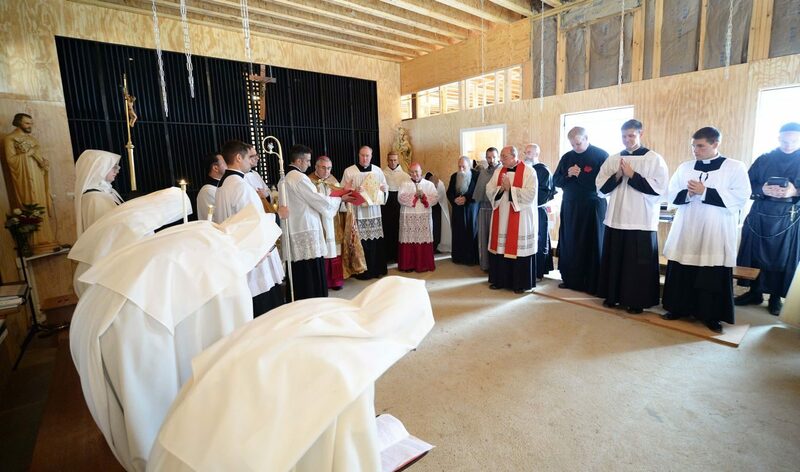 Harrisburg Bishop Ronald W. Gainer celebrated the July 25 Mass in the carmel’s newly constructed barn that will serve as a temporary chapel until the permanent stone chapel is built. The new barn also includes a kitchen, refectory, choir, an area where people can leave prayer requests, donations and food, and a speak room that allows the nuns to receive limited visits from behind a grille. Nine Discalced Carmelites, including Mother Stella-Marie, moved from the at-capacity Carmel of Jesus, Mary and Joseph in Elysburg to the Fairfield site July 20. They will sleep in their individual cells in a temporary mobile home until the monastery is built. This community of Discalced Carmelites first came to the Diocese of Harrisburg from Lincoln, Nebraska, in 2009, due to their growing numbers. Initially 11 arrived at the Carmel of Jesus, Mary and Joseph in Elysburg, after the previous Carmelites moved to their current location in Danville. Since their arrival in Elysburg, their numbers have more than doubled, with the monastery there filling to capacity with 28 nuns. Among them was Sister Mary Magdalene of the Divine Heart (formerly Channing Dale of Assumption of the Blessed Virgin Mary Parish in Lancaster), who entered in 2013, and is currently enclosed in the Discalced Carmelite community in Philadelphia. The Carmelites continue to attract young women to the congregation, and so the available farmland in Fairfield — owned by the parents of Mother Therese — offered an opportunity for expansion from Elysburg. Like St. Teresa of Avila and St. Therese of Lisieux, the Discalced Carmelites practice the traditional aspects of Carmelite and monastic life — prayer, fasting, enclosure and union with God. Entering the cloister from locations throughout the world — including Australia and Ghana — they dedicate their lives to prayer and sacrifice to give themselves totally to God for the world. Enclosed in the monastery, and leaving behind family and friends, they spend their days in scheduled times of silent prayer, the Divine Office, holy Mass, recitation of the rosary and adoration of the Blessed Sacrament. They also have time for work in making clothes, baking bread, and tending to the garden and farm; and recreational time for sewing, artwork and storytelling. For this reason, it is critical that the new monastery in Fairfield be built in the Carmelite tradition, said Mother Therese. Watching as excavators wrenched stone from the land for construction, she told The Catholic Witness, Harrisburg’s diocesan newspaper, earlier this summer, “People expect us to be real nuns, all the way through. They don’t want to see a nice veneer on the outside, but then something different inside. “We have a lot of young vocations coming. We need to be able to teach them not just one or two hours a day about tradition. They need to learn 24/7 from these stone walls, which are authentic all the way through,” she said. The blueprints for the monastery farmstead illustrate buildings designed to stand the test of time: a chapel, a refectory, a novitiate, a building for the professed, a caretaker’s home, chaplain’s quarters and a guest cottage. Their construction requires authentic materials and craftsmanship as the Carmelites build for future generations of their congregation. Throughout the project’s development, the nuns have continued to be the beneficiaries of generous donors and volunteers who have offered their time, talent and treasure. They include stonemasons and timber framers, among them a mason from Scotland who instructed local volunteers in the craft, notably a “dry build” of the all-stone woodshed. Benefactors have donated barn wood and stone that will be used to construct the buildings. Volunteers have spent time deep-cleaning the donated wooden beams. Others have been providing meals for the workers. Still others have helped with the build, including men of the local Amish community. As Mother Stella-Marie and Mother Therese walked the new grounds in Fairfield, they also spoke of long-fostered relationships with family and within the community, and how they change with time. The nuns are experiencing a degree of separation in their community as this new chapter begins. Nine of the total 28 from the monastery in Elysburg are now forging a new foundation in Fairfield, and parted ways from their counterparts who remain enclosed some two hours to the north. Editor’s Note: Information about the Discalced Carmelite nuns, the progress of the monastery in Fairfield and volunteer efforts can be found at www.fairfieldcarmelites.org. Reed is the managing editor of The Catholic Witness, newspaper of the Diocese of Harrisburg.